Enter the amount you are looking to borrow, otherwise referred to as Principal. Enter as a dollar amount, but without the dollar sign and any commas. Enter the annual interest rate you will be charged for the loan. Enter as a percentage but without the percent sign (for .06 or 6%, enter 6). Enter the number of years you would like to spread your payments over. The longer you take to pay back the loan, the more of your hard earned money will go toward paying interest charges to the lender. Select the payment frequency you would like to use for repaying the loan. Select the month, day, and year you plan to make your first payment. The calculator will use this date to create a payment schedule should you choose to have one included in the results. Schedule?Include schedule?Include payment schedule?Include payment schedule? If you would like the results to include the payment schedule, slide the button to the "Yes" position. If not, slide the button to the "No" position. Optional: If you would like to see how many hours you will need to work in order to earn the after-tax, after-work-expense income needed to pay back this loan, enter your real hourly wage here (clicking link opens new window with Real Hourly Wage Calculator). Based on your entries, this is how much your payment will be for the interval you selected. Based on your entries, this is how much interest you will pay between now and when you make your final payment. Based on your entries, this is how many hours you will need to allocate to working in order to earn the after-tax, after-work-expense income to pay back this loan. 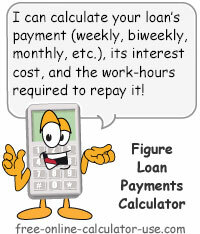 This calculator will calculate the periodic payment amount, the interest cost, and the work hours required to pay back a loan. The calculator also allows you to choose your preferred payment frequency and the results include an optional payment schedule. If you would like a side-by-side comparison of up to four different loans, please visit the Fixed Payment Loan Comparison Calculator. Enter the amount you are looking to borrow. If you chose to include the payment schedule in the results and would like to open a printer friendly report for printing, scroll to the bottom of the schedule and click the "Printer Friendly Schedule" button. This will open the schedule in its own window for printing. Of what you are giving up before you sign on the dotted line. Imagine you are standing at the corner of a high speed, two-way intersection. Would you check traffic in only one direction before deciding to walk across? Of course not. But financially speaking, that's how millions of people approach their financial decisions every day. How so? Because they focus on what they will get with their purchases without considering what they might be giving up. Sure, you might get lucky the first few times you "cross the street," but eventually you're going to get blind-sided by the negative financial consequences you failed to see coming. If you are considering a purchase that is large enough to require taking out a loan, please consider the following "hidden" costs of going ahead with the purchase. How many hours I will need to allocate to work to pay off this purchase? How much passive investment income could I earn if I invest the money instead of using it to make this purchase? Can I afford to set aside the funds needed to license, maintain, repair, fuel, insure, store and replace this purchase so I won't get blindsided by these costs in the future? Life is a lot more predictable than we care to admit. If you fail to accurately answer the above questions before going ahead with the purchase, you will likely be creating "unexpected" financial emergencies for yourself in the future.